I have been to 3 dermatologists and have gotten 3 different diagnosis for my painfully dry cracked skin. Someone said your product might help. What do you recommend? Ouch! The lines between eczema, psoriasis and dermatitis are often blurred so don’t be surprised that different doctors will put a different name on your skin issues. While we do not pretend to diagnose, treat or cure any disease, thousands of people with a wide variety of dry skin conditions have found soothing relief by switching to our organic products. Why is this? First, it’s what’s not in the stuff that counts. Dry skin reactions can often be caused by overexposure to commonly used molecules in our lives; both natural and synthetic. You have to be your own Sherlock Holmes and patiently observe your own behavior and reactions to uncover your exact sensitivities. Download a free copy of my book, “The Reactive Body Handbook”, www.reactivebody.org for more complete information on how to live more comfortably in YOUR reactive body. Second, it is what is in the stuff that counts too. Many natural oils and herbs contain molecules recognized for thousands of years for their inflammation soothing properties. The herbalist product formulator’s job is to herd those molecules together into a form that is usable, effective and generally affordable. When soothing inflamed reactive skin we first recommend a “product fast”. A product fast is like a food fast except that for one week you do not let anything touch your skin that was not made by Vermont Soap or washed in our products. If you are super reactive right now, start with unscented products. Wash a top and bottom sheet, pillowcases (try putting pillows in a hot dryer for 20 minutes instead of washing them), and all your clothing for one week in our Castile liquid soap based cleaners. Use our Foaming Hand Soap for hands, our Organic Underarm Deodorants, our special bar soap for sensitive skin and Peppermint Tooth Salt for teeth and gums. If we don’t make it – you don’t use it. Hair care products included! Our best product for skin cleansing (hands, face, scalp, body) is the Shea Butter Bar Soap. Contains no essential oils and is made with our own special skin soothing herbal oils. You will love it. Replace white lotions and petrochemical skin products with Green Gold Herbal Moisturizer (day) and Pure African Shea Butter (night). Once you get use to waterless moisturizers you will never go back. Put ALL your laundry products aside and use Unscented Liquid Castile Soap or (citrus oil containing) Liquid Sunshine Nontoxic Cleaner for laundry, dishes and surface cleaning. And you can soothe your everyday aches and stiffness with Arnica Salve for natural relief without the petrochemicals thank you very much. 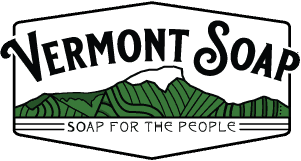 Most Vermont Soap products are certified to USDA organic standards by Vermont Organic Farmers (VOF). We support organic agriculture, 1% for the Planet and your right to be a chemical sensitive person in chemically insensitive society.